Binder Jetting is an additive manufacturing method that creates parts additively with a binding agent. The process uses a liquid binding agent deposited on the metal powder material, layer by layer, according to your 3D model. Between each layer, the powder is lightly cured for solidification. When the printing process is complete, the build box is removed from the printer and placed into an oven for curing. When the process is over, an operator carefully extracts the parts from the build box and removes the remaining powder thanks to brushes and air blowers. When the process is done, the parts are separated from the runners, cleaned and beadblasted to remove the remaining powder. The part can now be shipped to you or finished according to your choice. The metal binder jetting technology was developed by the company ExOne since 1996. 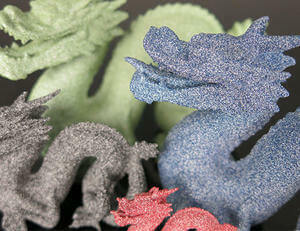 At Sculpteo we are using the M-Flex printer to 3D print your part in metal binder jetting. Binder Jetting Stainless Steel 420 BR has a maximum building size of 736.6 X 381 X 361.95 mm for raw printing. If you choose the plating option, the building sized is reduced to 177.8 x 177.8 x 177.8 mm and 152.4 x 152.4 x 152.4 mm if you choose the polished finish. Moreover, Stainless Steel 316 has a maximum size of 120 x 50 x 50 mm. The metal Binder Jetting process is the fastest and cheaper metal 3D printing technology. 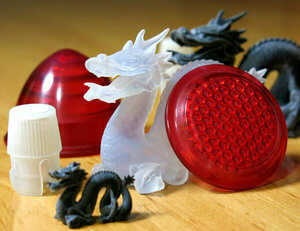 It perfectly fits prototyping needs, ornamental and decorative objects or jewelry thanks to the plating options. Metal Binder jetting can create complicated and highly detailed design in a very short amount of time. The cost of the metal binder jetting technology is lower than traditional manufacturing technique and other metal 3D printing technology thanks to the mixed material (Metal powders and binding agent). The main benefits of the metal binder jetting technology is the high customization possibilities and the fast production time. Thanks to our online metal binder jetting service, you can have access to professionnal binder jetting 3D printers to produce your part, distantly, and without needing to worry about operating the machines. You'll get your 3D printed metal parts, fully functional and ready to be used or integrated into a larger object, within a few days. Metal Binder Jetting can be used with many different finishing options. 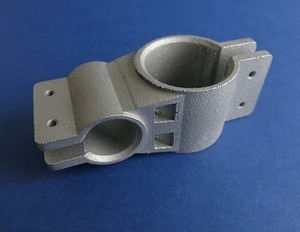 If you wish to 3D print a metal project with special requirements or specific platings, you can contact our sales-team. To learn more about the other metal 3D printing techniques, visit our materials and technologies pages. Metal Binder Jetting manufacturing technique is particularly useful to create unique metal parts with a good surface finish. With such a technology, you can create very complex shapes in a very short amount of time. Since Metal Binder Jetting has average mechanical properties, it is more suited to decorative objects and jewelry than technical parts. Nevertheless, for the Stainless Steel 420 BR, the infiltration process adds strength and resistance to the material and makes it useful for many applications. However, if your part needs to handle loads and stress, we suggest you to take a look at our DMLS and SLM metal 3D printing services that provide very precise and technical parts with excellent mechanical properties. Our Steel / Bronze 420SS/BR is a great metal material for decorative objects and jewelry. The polishing finishes and the plating options give a professional looking aspect to the material for beautiful ornamental parts. The material is infiltrated with bronze powder. Our Stainless Steel 316 has a strong resistance against corrosion and high temperature. 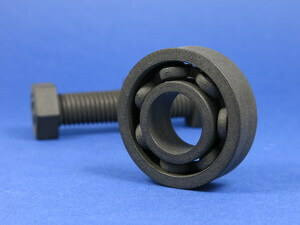 This material can handle complex shapes and is a perfect choice to 3D print small-size parts.